Reitaisai 6 "official" CD, sold exclusively at the event. Touhou Gensokyo ~ Lotus Land Story. / 東方幻想郷　～ Lotus Land Story. / Touhou Gensokyo ~ Lotus Land Story. Touhou Chireiden ~ Subterranean Animism. 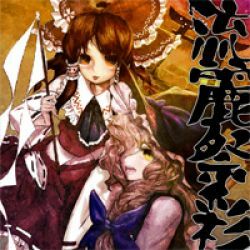 / 東方地霊殿　～ Subterranean Animism. / Touhou Chireiden ~ Subterranean Animism.